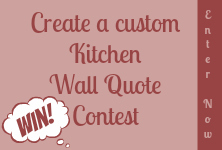 Belvedere Designs: Announcing the "Create a Kitchen Wall Quote Contest!" 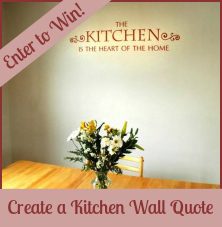 Announcing the "Create a Kitchen Wall Quote Contest!" The Belvedere Designs team is on the hunt. Since we're looking to expand our Kitchen Wall Quote collection, we're on the lookout for great new Kitchen wall quote (and wall art!) ideas. We want to hear from you (you always have the best ideas!) So - here's your chance exercise those creative juices and win your very own a custom wall quote for your kitchen (created by you! And, well, us too). If you could put any quote at all in your kitchen, what would it be? Where would you put it? How would it look? What would it say about you and your home and your kitchen? Submit your fabulous idea for a great kitchen wall quote below. Our team will review all the entries and vote for the idea we think will make the best, most creative, kitchen wall quote. Remember - the quote itself is a great place to start, but it's just a beginning. Think about the font choices (see our custom font preview tool for ideas), the overall style (whimsical, retro, classic, modern, country), and the layout (one long line, multiple offset lines, center justified, special emphasis on one or more words). Oh - and don't forget color (we have more than 45 to choose from). The winner will receive a real-live wall quote of his/her idea and, of course, we will showcase all the best ideas in the brand-spankin', spiffed-up, new Kitchen collection on our website!